When we first met, the little lady and I used to revel in any chance we got to get out of town and head bush. Go walking, hiking, riding, kayaking or just exploring in general. But since the arrival of the ‘lights’ of our lives, time and drive to do so has dwindled to near null. In fact last time I suggested a bush adventure I was met with a quirked eyebrow, a gaped mouth and a rather shrill ‘Uhh… why?’. It wasn’t exactly encouraging as such an encounter lingered in the back of my mind while I plotted a new adventure. 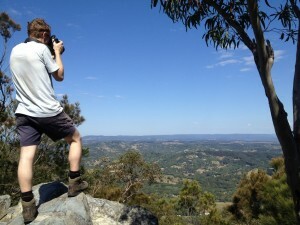 This time I had my eye set on Mount Cooroora, forty minutes north of our home in Maroochydore and host of the infamous ‘King of the Mountain’ event. 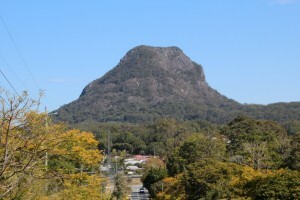 The race runs from the centre of the Pomona Township, through streets crowded with well-wishers and supporters, then heads ‘bush’ towards the mountain. 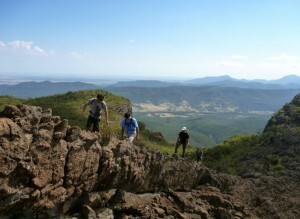 It covers a distance of 4.2km, racing to the top of the mountain and back. A test of agility strength and concentration, truly a great test of human physicality. Of course I wasn’t going to put my lovely wife through all that, we’d take our time and enjoy all the mountain has to offer, amazing breath taking views, beautiful natural bush and wild life and of course the pure sense of achievement you get from conquering such a trial. We found ourselves with a free day without kids and I saw my chance, summed up my courage and broached the subject with tense caution. 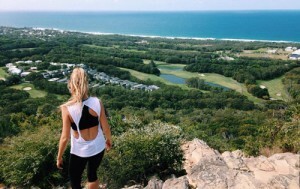 Her reaction was to simply stand up, and get changed into her hiking gear. She looked upon my shabby and shocked appearance with a different quirked brow. ‘We going?’. Forty-five minutes later we parked and began our trek to the top. To add to the fun we always liked to pretend we were an expedition to the summit of some as yet unconquered giant like Everest or the Himalayas, a pair of wide-eyed adventurers of yester-year. As always I had my digital camera on hand and snapped a mirage of images to mark the occasion, as well as capturing the amazing natural beauty you can’t find anywhere else but deep within the Australia bush. I recall one of my favourites being an amazing image of a stunning butterfly with a striking, almost pearlescent blue wing colour, edged with a deep black that made its sparkling blue hues stand out even more. I was able to capture it mid take off as its wings started to flutter, and its tiny feet hovered above the petals of the wild flower it had taken refuge on. It was my favourite, until I snapped an opportunistic shot of the wife as she climbed up the rock wall ahead of me; I appreciate this one for personal reasons. We reached the top, after besting what could only be described as little more than a goat trail with a few steps cut in along the particularly sketchy parts. The feeling of accomplishment washed over us and we cheered and hugged each other in part exhaustion and part relief in the cool early morning air. It took a moment or two before either of us had realised where we were standing. We were overlooking one of the most spectacular views I’d seen in a very long time. The horizon stretched out before us, with rolling hills of tall, proud green trees and farmland dotted with little farmhouses overlooking their own little domains. 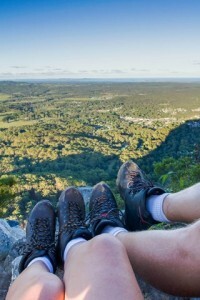 It truly was an indescribable moment and we sat contently in each other’s arms and the cool breeze for a countless amount of time, I cannot recommend these little adventures enough, and specifically this little hike. 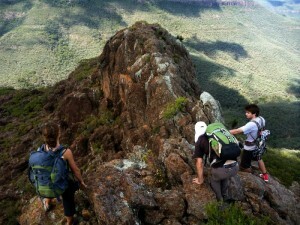 For more information on the mountain and its trails visit you can find some good info on the Aussie Bush Walking website.